For anyone who professes to be a golf purist, the Adidas Men’s Adicross II Golf Shoe may appear to be a bit of a joke. At first glance this shoe appears to be something you would wear with a pair of jeans and certainly not on a golf course! Although it does not look like any other golfing shoe, anyone who chooses to overlook the Adidas Men’s Adicross II Golf Shoe will surely regret it when they become fully informed about this product. Since most of the very best golf shoes are made of leather and the Adidas Men’s Adicross II Golf Shoes are made of 100% leather, it is a good start. This shoe has the common rubber sole of a sneaker, but it is the TRAXION technology that features lugs underneath the shoes that make it different from other sneakers. The difference does not end there because unlike other golfing shoes, this design also features a spikeless outsole in addition to the outsoles also being ThiNTech. With regards to traction, the strategically placed 100 lugs will ensure that you experience no slipping while on the course. This technology which is instead of the spikes, accounts for an amazing grip whether you’re playing on a wet or dry course. Some individuals find the most outstanding feature of the Adidas Men’s Adicross II Golf shoe to be the fact that they can be worn from the Course to the Mall and consider this a good buy because it’s not only for the golfing course. This design serves as two pairs of shoes in one. As a golfer you will also have a life outside the golf course. With the Adicross II, you will no longer have to keep an extra pair of shoes in your trunk for outside the golf course. Now you will be able to simply go from the golfing course directly to the mall or any other location, while wearing the same stylish pair of shoes. 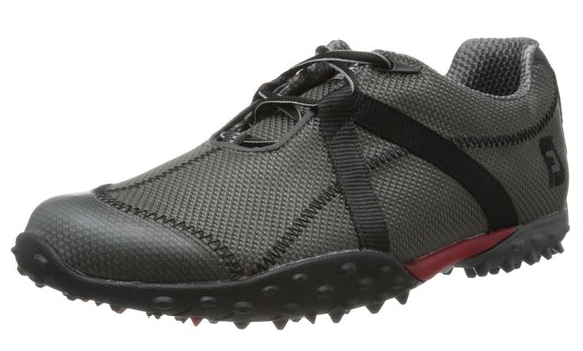 The Adidas Men’s Adicross II Golf shoes won?t look out of place once away from the course. These shoes promise to provide you with comfort unlike any other, thanks to the CloudFoam sock liner. You will find that these golfing shoes are one of the most comfortable you’ll ever wear. Because this feature also ensures superior cushioning you could play 18 holes and may even play 36 holes without your feet feeling very bad at all. Everyone who has a pair of these shoes can enjoy the same cushion and comfort even when they are not at the golf course. Wearing them will ensure that you experience a high level of comfort throughout the day. The cushioning, level of comfort and traction of this shoe has pleasantly surprised many individuals who were not expecting this type of performance from what appears to be a sneaker one would wear for a leisurely stroll. Some are wary about moving around the slopes in rainy weather, although it does not matter what type of shoes you are wearing, caution is always advisable in wet weather. The Adidas Men’s Adicross II Golf Shoe would be a good buy if you are used to conventional golf shoes and are looking for something out of the ordinary. Looking for a review on the best spikeless golf shoe? Then check out our review here.